Mission Statements and Goals for your homeschool? Yes, hear me out. You do not need a Homeschool Mission Statement, but I can tell you that having one does give you a focus when times get tough. And times will get tough as a homeschool mom, that I can promise you. A family mission for our homeschool gives us a clear path as to why we homeschool and what our priorities are. It states our big picture goals for the education of our children. What are our educational goals? What do we want them to learn? Why? What life skills do we want our kids to have? What kind of environment do we want in our homeschool? Why does homeschooling provide the better environment for our family? Why homeschool rather than public or private school? I promised you that there will be tough days ahead. Homeschooling is not easy and there have been times I have wanted a big yellow bus to pull into my driveway. But homeschooling is without a doubt the best and most important thing we have done for our children, and I wouldn’t change it for anything. A quick glance at your Homeschool Mission Statement on those tough days, along with coffee and a prayer, can give you a much needed reminder of why you are doing this and provides guidance and encouragement to keep going. Now is the perfect time to set goals for your homeschool. Most homeschool moms I know are in full out planning mode right now and we love it. When you think about starting a new year, do you start out with goal setting? 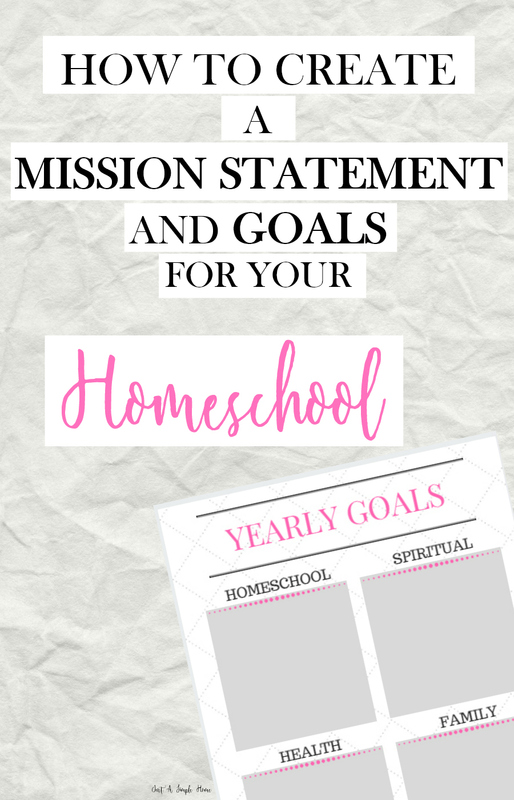 Just like with the Mission Statement, having goals for your homeschool will give you a focus for the year. It can also help with things like choosing curriculum and figuring out learning and teaching styles. This is the most obvious area to start in. Armed with your Mission Statement, decide what you would like your child to get out of your homeschool year. What skills do you need to focus on? What are their strengths and weaknesses? What are their natural interests? At the end of the year, what do you want them to know? Having academic goals can help you choose curriculum that will align with those goals. My son has had an interest in sea life since he was a baby. I do make sure that some of his science focuses on marine life, while making sure he has a well rounded knowledge of other science areas. One of my daughters gets very distracted while reading, so I make sure that she reads aloud to me and has some audiobooks available to her. You child may be at the age where they are learning to read, so your year will be focused on finding games and readers designed to teach phonics. You may have a child that craves structure or one who thrives independently, so your curriculum choices may reflect that. Start here and decide on your academic goals for each child. These goals can be far more important than the academic goals you set. Are their any character traits you need to work on? Don’t just focus on the negative. If you see something budding inside your child that you want to foster and bring out, write that down. I know as a mom to many children, we often have to work on treating other siblings the way we want to be treated. Some of my children work well together and others don’t, and it is my job to find that balance. Make a list of personal and family goals you’d like to work on this year. Don’t be afraid to get your children involved in these as well! I am always surprised at the honesty my children have with these. These goals tend to be more personal, so I won’t tell you how to set these. I just encourage you to actually set them. One of the most important reasons we homeschool is so that we can give our children a Christian education, and our yearly goals reflect that. As far as setting health goals, I am not talking about losing weight here. The health goals I set for our family often involve our nutrition and food choices. I teach my children about why we eat certain ways and why we avoid certain things, and how to properly fuel their bodies. I want my children to feel equipped to make healthy choices for their bodies as they get older, when I am not telling them what to eat and drink, or why they need to exercise. Your health goals make look completely different than mine, and that is fine. What is important is that you take a few minutes to think about them and write them down for all to see. I created a printable for you to write out your yearly goals. You can print out one for the family or one for each child. I just hope that this inspired you to create a Homeschool Mission Statement and Goals for your family. You will be off to a great start for your homeschool year! Don’t forget that this post is part of a 10 DAY SERIES I am doing with 15 other homeschool bloggers! Check out their posts below! Wow, this is a great thought. I never considered homeschooling to be so professional but hey if we want to get anywhere in the world, we have to have goals and a mission statement. Thumbs up Terry, thanks for educating us. These are great reminders to keep our focus on what truly matters. What a great idea! So good to take the time to clarify your homeschool goals. I’ve just been homeschooling for one year and it has felt overwhelming at times. This is such a great idea. Coming from someone who was a public school teacher but is now looking to home school. I know structure and goal setting will be so important. Thanks for the ideas! I love how you broke it down to bit size pieces. It can be overwhelming when you are trying to set up your mission statement and goals. But if we do it a step at a time the process would be an enjoyable one. Thanks for sharing!